Thanks to the generous support of the Ontario Arts Council, I am heading down to NCECA tomorrow! 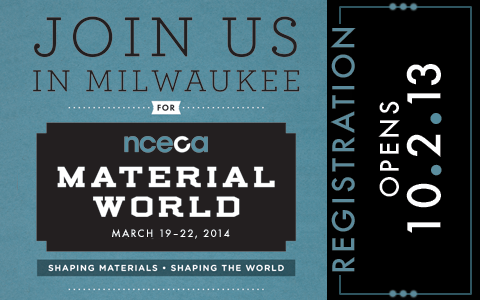 This will be only my second time going, so I’m still a relative NCECA newbie. Last year when I went down to Houston, I barely knew anyone—this year (thanks to all the great people I’ve met through Medalta) it’s a different story. Plus, it’s in Milwaukee this year, which is apparently the beer capital of the US… I’ve never been a huge beer drinker, but I think that might be because I haven’t done enough research. I like research. If you are going to be there, I am helping out at Medalta’s booth (booth T40 in the resource hall), so stop by and say hi. This entry was posted in Community, Medalta, News, Travel and tagged Medalta, Milwaukee, NCECA, Ontario Arts Council by naomiclementpotter. Bookmark the permalink.